After years of chaos and anarchy, The Renegades, a team of heroes with extraordinary abilities, have worked hard to reestablish law and order in Gatlon City and give hope to the city's residents. The Anarchists, who were once one of the most powerful villain groups in the city, now greatly reduced in numbers, have been banished to the city's underground subway system, and The Renegades no longer see them as the serious threat they once were, but now simply a nuisance to be kept in their place. Nova once believed in The Renegades too, but when she needed the heroes' help most, it was The Anarchists who saved her. Now, as a villain called Nightmare, Nova shares The Anarchists' vision of a city free from The Renegades' control, and although the Anarchists no longer pose much of a threat to The Renegades, Nova has a plan, to infiltrate The Renegades and take them down from the inside. Adrian is a Renegade through and through, but although The Renegades are his family, there is one thing they can't give him: answers. He wants to know who killed his mother and how the mysterious new villain, Nightmare, may have been involved. But Adrian has secrets of his own, and if any of The Renegades find out the truth, he could find himself in deep trouble. Renegades is a fun and fascinating study in the difference between how someone comes to be perceived as a hero or as a villain. In Nova's mind, The Anarchists are the heroes trying to free the city from the rule of the corrupt, unelected Renegades. To Adrian, The Anarchists are evil, violent murderers. But The Renegades are simply trying to help the city, and, in a very different way, so are The Anarchists. 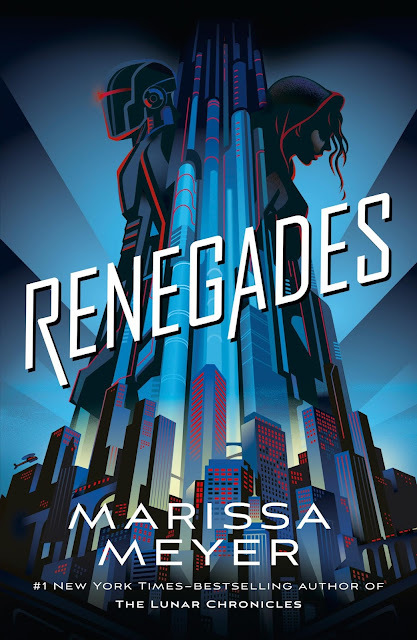 Nova's plan to take down The Renegades requires her to first become one of them, and as she starts to see the other side of the story, that The Renegades maybe aren't all as bad as she previously thought, her loyalties and her beliefs start to be tested in ways she hadn't anticipated, especially once she gets to know Adrian and his team. Adrian, on the other hand, has his own battles to fight, that mean he must grapple with his morality in a very different way. Renegades is full of interesting characters, my favourites being Nova's small band of Anarchist friends, and set in an interesting world, in a city home to many Prodigies (people with superpowers) who are permitted to audition for The Renegades, but only accepted if their powers are deemed useful enough, and even more people with no powers who must rely on The Renegades for safety whether they want to or not. The questions of who deserves power, who gets to be a hero, and who decides are present throughout the book, and as Nova becomes deeper embroiled in the world of The Renegades, the lines between good and evil become further and further blurred. Of course, being a book about superheroes and villains, there is plenty of fighting, double-crossing, and secret-keeping, and enough twists and turns to keep the story entertaining through all 500+ pages. Combined with the questions of morality that the story explores and, of course, the budding relationship slowly forming between Nova and Adrian, Renegades is full of story and intrigue and is definitely worth a read for any fan of superheroes, science fiction, or just really good young adult novels in general.